The Club Room is located on the first floor beside the Great Room. It offers an ice machine, vending machines, puzzles, board games, and playing cards for your enjoyment. The Fitness Center is located on the West Wing of the first floor and is open Monday-Sunday 7am-9pm. Beauty Salon, Jewelry & More! Patricia’s Salon is located on the first floor of the East Wing of The Carillon. It is open Tuesday-Thursday (March-October) and Tuesday-Friday (November-March) by appointment. Laundry Rooms with coin operated washers and dryers are located on the second floor on both East & West Wings of The Carillon. Laundry Rooms are open 7am-9pm. Have you read a good book lately? The Library is located on the first floor of the East Wing of The Carillon and is open 24 hours a day. One of our resident favorites. Puzzle Central is located in the back of the Great Room. Our guests often work together, or at their own pace, assembling puzzle masterpieces. Mingle with friends in the Great Room located on the first floor of The Carillon. It is accessible 24 hours a day and offers a 50” flat screen TV & DVD player for your enjoyment. 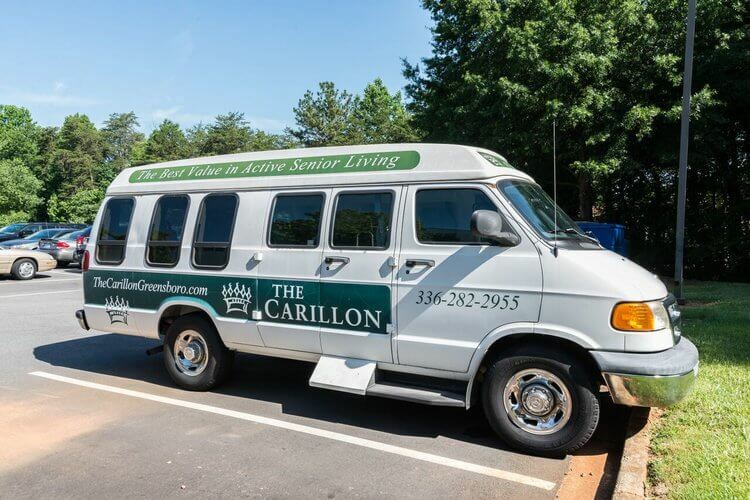 The Carillon offers scheduled weekly transportation for your convenience. We offer weekly trips to the grocery store, to the mall, and other points of interest.